Firearms make their appearance in Siren 2, mainly centred around the equipment of the Self Defence Force. Unlike the first game, which was based around clubbing-type weapons, these items bring a new development to combat, which will be explained in depth here using photographs. What happens when the darkness clashes with modern technology? 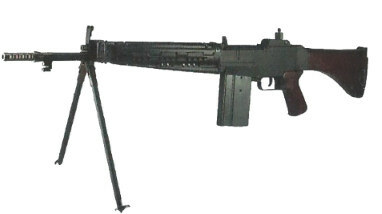 A domestic rifle officially adopted by the JSDF in 1964 (maximum capacity 20 rounds). It uses 7.62mm NATO rounds, more powerful than more commonplace 5.56mm NATO rounds, but is rather heavy for a military rifle. A version also exists that is equipped with a sight to facilitate sniping. An automatic rifle officially adopted in 1989 as the successor to the Type 64 rifle (maximum capacity 30 rounds). It is a small and light model with attention paid to its manoeuvrability, and is categorised as an assault rifle. It uses high speed, small calibre 5.56mm NATO rounds to allow more to be carried. 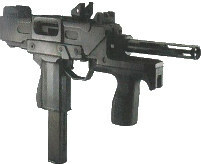 A machine pistol used by the JSDF that uses 9mm rounds (maximum capacity 25 rounds). It is, in actuality, more like a submachine gun. In form it resembles an Israeli UZI with a foregrip attached, but it was developed independently by Japan. It boasts a rapid fire capability of 1,100 rounds per minute. The official handgun of the JSDF, adopted in 1982 (maximum capacity 9 rounds). As it was created under the licence of the SIG Sauer P226, made by Swiss gun manufacturer SIG, it uses 9mm parabellum bullets. A flare gun, meant to facilitate communication between units, that can fire flares to signal things such as attack charges. This is actually a rare item, not often seen on the battlefield due to the popularisation of radios. 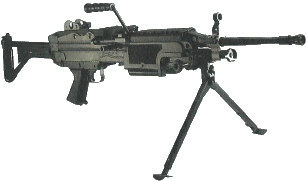 A machine gun used by the JSDF as the successor to the 7.62mm Type 62 machine gun (maximum capacity 200 rounds). It was created in Japan under the licence of a squad automatic weapon developed by Belgian arms manufacturer FN. Used by many armed forces, it is light and reliable. Unlike the previous game, Siren 2 features many firearms. The addition of playable JSDF members added a new depth to the gameplay. Despite being known as an artisan of horror games, it seems as though the director, Keiichiro Toyama, is actually quite interested in the military as a whole, beginning with FPS games. In accordance with Siren 2's development, he actually did research with people such as the JSDF. Hobby Japan's magazine "Arms Magazine" also cooperated with historical investigations. 01 - Touching a weapon (a toy gun) that appears in the game in real life, getting a feel for its details and usability. 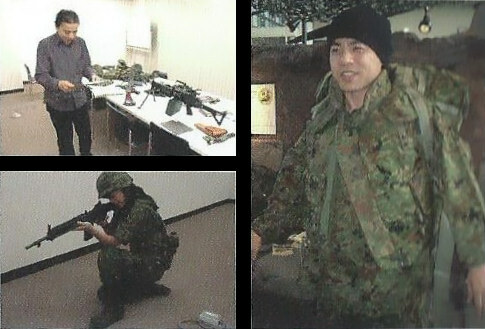 02 - AP Watanabe dresses in full land JSDF gear and readies a Type 89 rifle. 03 - Mr. Toyama kitted out like a JSDF member during his research and looking satisfied.